© GEM.Ms. Irina Bokova, Director General of UNESCO became Honorary Membership at Global Education Magazine. 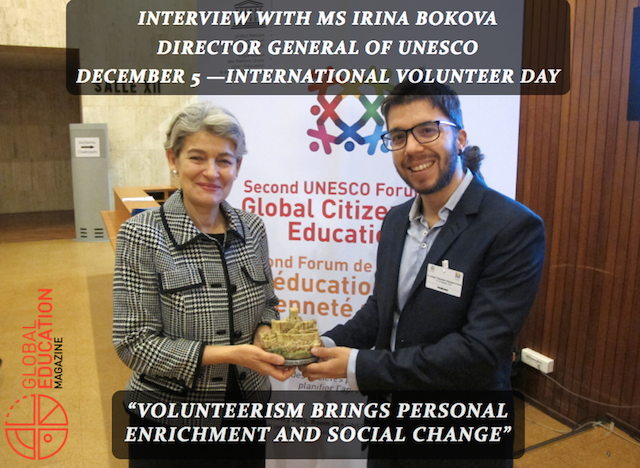 Javier Collado Ruano: Today, 5th December 2015, being International Volunteer Day, we welcome our special guess, Ms. Irina Bokova, Director General of UNESCO. I have had the opportunity to talk with her during the 2nd UNESCO Forum on Global Citizenship Education held in February 2015 in Paris, where she became our Honorary Membership, and during the World Education Forum of Incheon (South Korea) in May 2015. Dear Ms. Bokova, thank you very much for sharing your time and reflections with all our readers. Six years after your election to the leadership of UNESCO, how would you assess the results? Would you say that UNESCO has a better role and a better place in the UN system today? 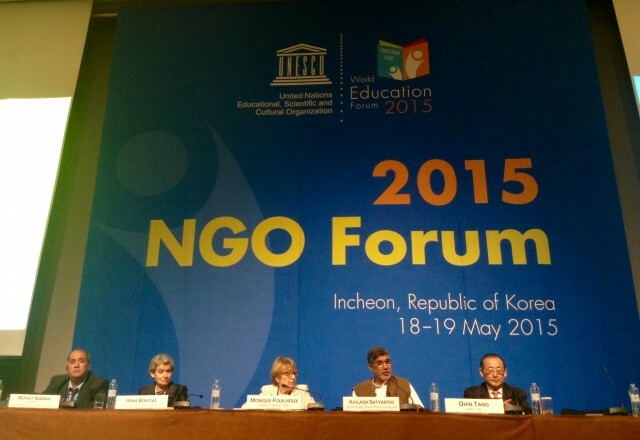 Irina Bokova: Like the United Nations, UNESCO is celebrating its 70th anniversary this year. November 16 marked the official day of the adoption of our Constitution seven decades ago, which states that “since wars being in the minds of men, it is in the minds of men and women that the defences of peace must be constructed.” We had convened a Leaders’ Forum to celebrate, take stock and look forward. The Forum took place, but in an entirely different spirit, dedicated to all the victims of the brutal terrorist attack that struck Paris on 13 November – attacks against youth, against culture, against our shared values and our shared humanity. Every leader who took the floor stressed that UNESCO was more than ever a force for peace. President Hollande affirmed that UNESCO is the moral conscience of humanity and underlined our essential role in promoting the diversity of cultures, the pluralism of opinion and belief, and education as a driver of universal emancipation. I took office on a platform of new humanism, fostered through respect for diversity, human rights and dignity. This can only be advanced through universal access to quality education, through the realization of gender equality, through the sharing of knowledge in all fields to strengthen resilience, through the defence of freedom of expression for all, through protection of our cultural heritage – tangible and intangible. Today, more than ever, education, intercultural dialogue, science and freedom of expression are arms of resistance and resilience, sustainability and peace. Today, UNESCO’s priorities are built firmly into the 2030 Agenda for Sustainable Development, and I see this as a real accomplishment – the result of advocacy, negotiation and a global understanding that the soft power we stand for matters for peace, for building more just, equitable and inclusive societies. Let me take the example of education. We have adopted a new vision that builds on lessons learned over the past decade and sets bold benchmarks: twelve years of free education for all, qualified and duly trained teachers in every classroom, attention to technical and vocational education and training, and focus on the very mission of education – to foster new forms of global citizenship and responsibility towards the entire human family and the planet. We see this largely reflected in the new agenda for sustainable development adopted at the United Nations in New York in September. UNESCO has shaped this new vision that is now an integral part of the 2030 Agenda, with an ambitious, universal and comprehensive goal. JCR: According to the Education for All Gender Report launched by UNESCO this year, less than half of countries have achieved gender parity in education. Why is so important to empower girls, young women and mothers to achieve a sustainable future? IB: First of all, because it is a fundamental human right, a matter of social justice and just as important, because investing in girls is the highest yielding and most sustainable investment any country can make. The evidence is irrefutable, whether you look at the positive impact on poverty alleviation, child and maternal health, HIV prevention, later age of marriage, income, productivity, civic engagement. The figures cited in the report demonstrate that we have to put far more political will, advocacy and resources into keeping girls in school – by acting on family poverty, on school safety, on teacher training, on curricula – so that education is emancipatory and empowering. There is no insurmountable obstacle. We see the breakthrough that can happen with governments are committed, when they improve water and sanitation, run campaigns, implement school feeding programmes, increase the number of female teachers. Real equality is not just a numbers game – it requires a change in mindsets, in policies, in social norms, in beliefs. This is why, together with UN Women and UNFPA, UNESCO is launching a Joint Programme for the Empowerment of Adolescent Girls and Young Women through Education, to focus on the most fragile transitions in the learning cycle and widen the lens to drive real change. We are taking a life cycle perspective that will strengthen the nexus between education, health, gender, equality and empowerment, working across ministers as well as with civil society organizations, in South Asia and sub-Saharan Africa. I am convinced that the face of sustainability and peace is that of a 12 year old girl who is not taken away into child marriage, who goes to school, in a safe and enabling environment, and who is given the confidence to make informed choices and decide on her future. This is the right and the world for which I am fighting. JCR: From ending poverty to ensuring healthy lives and taking urgent action to combat climate change, the 17 Sustainable Development Goals call for an unprecedented level of global solidarity, to leave no one behind.What is the role of global citizenship education to achieve a transnational and transcultural consciousness about global problems? IB: Global citizenship is the third pillar of the UN Secretary-General’s Global Education First Initiative, launched in 2012 and taken forward by UNESCO with an engaged group of high level partners and champion countries. Simply put, global citizenship education has come of age and it is essential. It goes to the essence of education’s mission – to show the way to living together, to promote mutual respect and understanding, pride in one’s identity and openness onto the world. More than ever today, we need to foster this sense of shared humanity and planet, and the responsibility it entails. Our globalized times call for global citizens and green citizens – versed in human rights, culturally literate, digitally literate, skilled for intercultural dialogue, capable of making a positive difference in their families and communities through daily gestures and actions. It is highly significant that global citizenship – and education for sustainable development – is included in the new Sustainable Development Goal on education. The 2030 Agenda calls for an “ethic of global citizenship”, for unprecedented global solidarity. UNESCO has taken an intellectual and a constructive approach, with the recent publication of topics and learning objectives for Global Citizenship Education to guide policy makers and curriculum developers. We will continue to place strong emphasis on this, because this is also the only way to counter violent extremism, to provide youth with the skills and maps they need to stand up for human rights, to reject ideologies of hate, to facilitate dialogue across all differences. And for this we have to support schools, parents and teachers. JCR: What were the strategies adopted in the World Education Forum celebrated in Incheon, Republic of Korea, for the next decades? What are the main challenges of UNESCO to face the Sustainable Development Goals led by the UN for 2030? © GEM. From left to right: Refaat Sabbah, Irina Bokova, Monique Fouilhoux, Kailash Satyarthi, and Qian Tang. IB: We should not underestimate the historic reach and legacy of the World Education Forum – co-convened with six UN partners, and more recently with the International Labour Organization coming on board. At this Forum – attended by over 1600 participants, including 120 Ministers and many partners from civil society, academia, foundations, the private sector and other – the world spoke with one voice to affirm that education is a public good, a fundamental human right and a shared responsibility. In September, the 17 global goals were adopted, with one full-fledged goal on education that is universal and comprehensive, and reflects the vision that we have advocated for over the course of national, regional and global consultations and negotiations. A few months later, in November, in the margins of UNESCO’ General Conference, more than 180 Member States adopted the Education 2030 Framework for Action – this is an implementation guide for SDG 4. Never before has the world crafted such a detailed road-map for the implementation of a new goal. Building capacities will be the name of the game – for systems, for teachers, for learners, so that no one is left behind and so that everyone draws lasting benefit from education. Legislative and policy frameworks have to be strengthened. Policies have to be targeted towards equity, inclusion and gender equality. Measures have to be taken to improve and the quality and relevance of education at all ages. Emergency situations must be addressed with far more resolve. And finally, adequate resources must be mobilized to finance our ambitions. Let me be clear that national governments are in the driver’s seat but the international community must support country-led action. The reality is that new funding is urgently needed to bridge the annual US$40 billion funding gap. Every country needs to meet the target of education receiving 6 percent of gross domestic product, and we need to reach the overall goal of education standing at 0.7% of official development assistance. This will call for political will and partnerships across social sectors to place education at the centre of development, because it is the most transformative force for prosperity, security and peace. JCR: What is your opinion about the role of civil society to achieve “The Future that We Want”? IB: We would not have the education agenda that was just adopted without the voice of civil society, and we will not be able to implement it without the experience, commitment and outreach of civil society. Civil society has a direct grip on the daily conduct of education, in communities, villages, cities and conflict zones. Through powerful networks and advocacy, civil society has a record of influencing legislative change, holding governments to account and making education a national and global cause, fuelling momentous progress since the World Education Forum in Dakar in 2000. This must continue. As global coordinator of the Education for All movement, and now mandated to continue with the coordination of SDG4, UNESCO has and will always ensure that civil society has a prominent place at the table, alongside Governments and other stakeholders. In 2014, the Nobel Peace Prize recognized the formidable and courageous role of civil society by awarding the prize jointly to Malala Yousafzai and Kailash Satyarthi. They stand several generations apart but are driven by the same unshakeable conviction in education as a fundamental human right that should be enjoyed by every child, regardless of their circumstances. We need to forge ever strong alliances for the defence and implementation of new education goal. The Education 2030 Framework for Action affirms the need for civil society to be actively engaged and involved at all stages, from planning through to monitoring and evaluation. Civil society has a critical role to play in social mobilization, raising public awareness, bringing marginalized voices to the centre, holding governments to account for their commitments, by scrutinizing spending, ensuring transparency in governance and budgeting, and developing innovative approaches to help advance the right to education, especially for the most disadvantaged. JCR: Finally, what message would you like to send to all our readers in the celebration of the International Volunteer Day? How could we motivate them to improve our common planet? IB: UNESCO is not directly involved in the celebration of International Volunteer Day but let me say that we stand behind every action of solidarity that reaches the most marginalized and empowers them with the confidence, knowledge and skills to better their lives. These networks of solidarity are crucial everywhere – they foster social cohesion, enrich our lives and make our societies more generous, compassionate and resilient. Waves of positive change can be generated through very small actions, and each one of them matters, including to cope with the impact of climate change, and to protect our environment and planet. Everyone has a stake in this, because we have to invent new models – of producing, consuming and living together. I saw this spirit of leadership expressed at the recent Youth Forum organized at UNESCO. Youth asserted their ambition to be a force for change, to increase intercultural exchanges, to act against injustice and discrimination, to improve the lives of all those who are marginalized. There are a myriad of initiatives going on everywhere and everyday around the world, driven by volunteers who give their time, ideas and talent to advocate, help, bring hope and change. Volunteerism brings personal enrichment and social change. It does not replace public responsibility but reinforces and complements it. Societies must give more recognition to the contribution of volunteers of all ages and showcase their achievements because they can have multiplier effects. This is also the essence of new humanism, the ethos of co-responsibility and active citizenship that lies at the heart of living together and building more tolerant and sustainable societies that leave no one behind. JCR: Thank you very much for your time and inspiring words, dear Bokova. I am looking forward to see you again to learn more about your rich reflections and experiences.